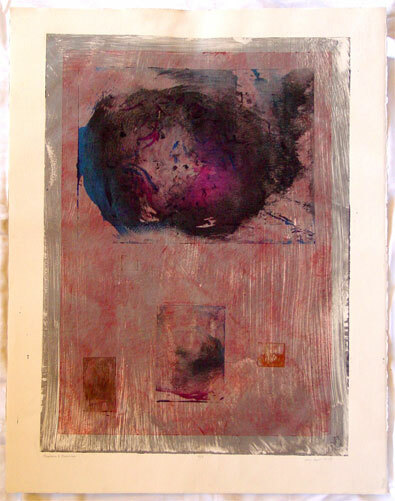 This is another monoprint created with layer upon layer of ink, running the paper through the press several times. I inked some of my small etching plates with the monoprint ink, which obscures the actual image etched on the plate and turns it into just another abstract shape in the composition. A total of 7 plates were used in this piece, some of them blank and some etched. Shadows and Balances, 18″x26″ monoprint on 22″x30″ watercolor paper, $399 with free shipping.